Rarely can anybody remember such a long summer as we’ve been (and still are) experiencing it this year. 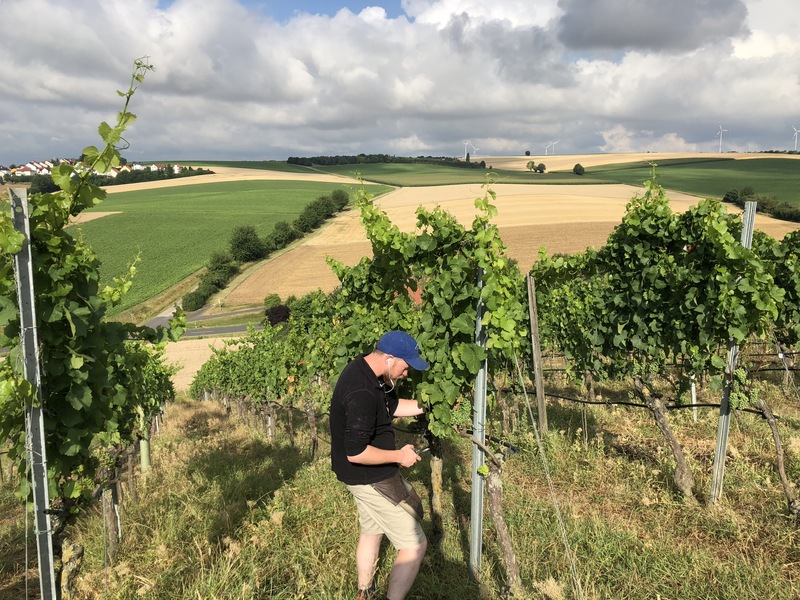 We had to start early in the morning many days to finish the fine-tuning in the vineyards, the afternoons were mostly too hot to work outside. Good that we had a fair amount of work left to do in the cellar. Wines we’re going to keep for a second winter in the barrel had to be racked (17 Wilde Heimat, Heimat Silvaner, Kleine Heimat and Spätburgunder) and of course there was wine left to bottle: the 2016 Wilde Heimat and the 2017 Drei Freunde, Black Betty, red Fledermaus and Kleine Wanderlust. It was a pleasure tasting them from the bottling tank and we’re looking forward to sending them across the world. In the past cleaning the tanks and barrels was a job to do early September before harvest kicked in. Aiming for August 20th as the potentially first harvest day we had to do this job earlier if we wanted to have at least one week for a little family trip this year. With our big cellar this means quite a bit of work. Good that Nick and Jule did a good part of it end June already and we just had two of our seven tank sections left. This allowed to clean the old barrels more properly than we could last year, inside, outside, from the top and the bottom, the back and the front. And there are a few meters of cellar floor to clean as well. Now everything smells wonderfully fresh and with only a few bits and pieces of preparation work remaining we’re ready to pick the 17 vintage. Last but not least a big thank you to Dave, Ben and Josh helping us in July! It was fabulous having you. Oh and also thanks Maddy for helping Nick bottling our harvest booze! Great post! Nice to see the update. I am wondering what the long summer might mean for the wine? A shorter than usual ripening period with a potential impact on complexity but otherwise – healthy grapes! Our vineyards didn’t really suffer from it.